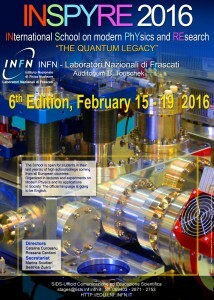 The National Laboratory of Frascati (LNF) of the Istituto Nazionale di Fisica Nucleare (INFN), Frascati (Rome) Italy, are organizing the 6th Edition of the INternational School on modern PhYsics and REsearch, under the theme: The Quantum Legacy. The School, to be held in the period of February 15-19, 2016, is open to about 60 students in last year(s) of high school/college, from all of the European countries. It is going to be organized in lectures on Modern Physics and its applications in Society (with particular care for the “hot topics”) and in activities to be performed in laboratories. The participants will have, as well, the opportunity to visit the main experiments and accelerator facilities of the LNF. The official language is going to be English. The activity is free of charge; however, participants should provide for travel, accommodation and dinner expenses (lunch is organized at the LNF canteen). 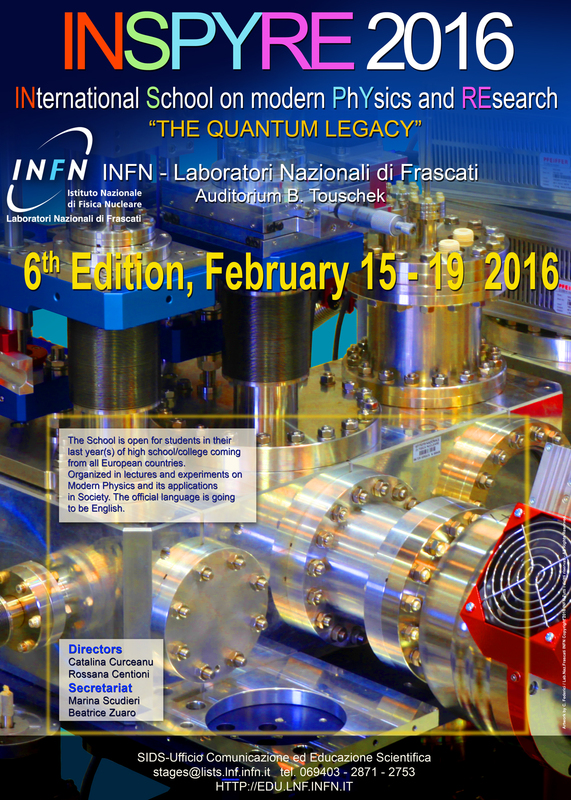 Browse the website of the 2015 Edition. Interview to the 2015 INSPYRE students. 12:45 – 13:15 The INSRYREd ones: short presentations of the previous INSPYRE editions’ participants – what are they doing now? 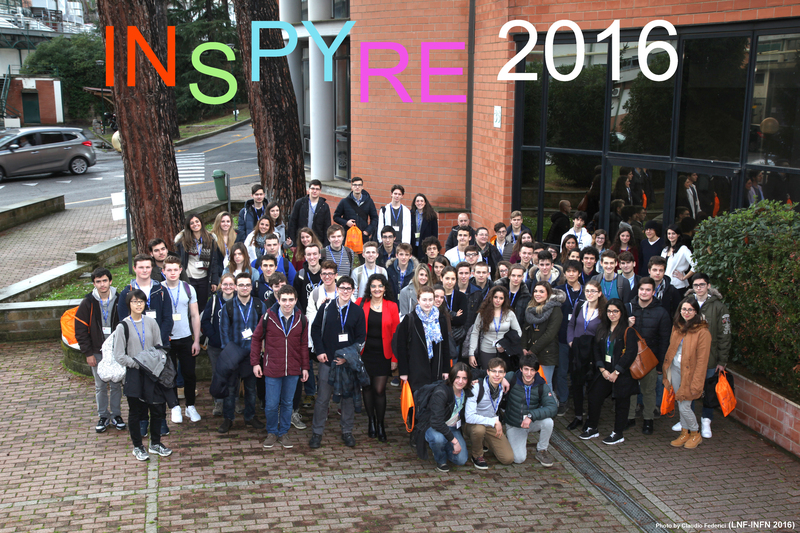 18:00 INSPYRE 2016 Happy Hour! In order to participate, the high-schools/colleges should send an official application to the LNF, indicating the names of max 2 students selected according to their curricula. Many participants are expected, so first comers will be advantaged. To send your application, you will be asked to fill in our form online. The deadline to apply is November 30, 2015. Please note, this application is reserved to non Italian students. The course Directors will select, among the applications, the most promising candidates. The LNF Communication and Scientific Education Office will contact the schools selected in order to define the details for their participation. The LNF is within walking distance from Frascati, the Hotel Villa Mercede and Tor Vergata Railway Station. The train station is very close to the LNF. Hotel reservations (multiple rooms; private toilet; 36 euros per night, per person;) are confirmed directly from our office to the hotel: Hotel Villa Mercede. Students will provide for the payment directly to the hotel. Students will attend the Labs during business hours (from 8am to 4pm) in agreement with the LNF tutors. The presence will be checked by LNF Guardiania in entrance and exit. In case of absence, delay or early exits, students must promptly notify the LNF tutors and the Communication and Scientific Education Office. In order to achieve the Participation Certificate, absences are not allowed except for important reasons. The activity is free of charge; however, the participants should provide for travel, accommodation and dinner expenses (lunch is organized at the LNF canteen during the days of the School). We recommend to observe the class schedule and an appropriate behavior to a workplace. We have a Facebook album! Tag yourself and your friends… or tag us into your pictures!